3D printing began with polymer printing over three decades ago as a revolutionary rapid prototyping tool, but today use of polymers in various 3D printing technologies are evolving into rapid tooling and manufacturing applications in ways that will enable the market for various thermoplastics, composites, and photopolymers to achieve massive growth over the next decade. 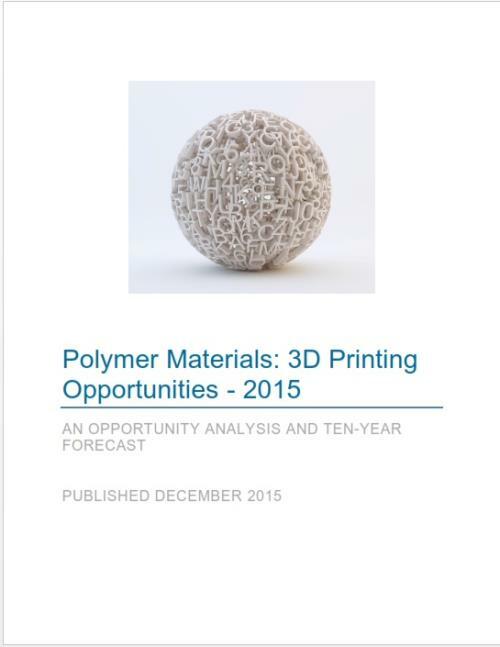 Polymer Materials: 3D Printing Opportunities - 2015 is the most comprehensive analysis of polymer 3D printing technology available in the world, with focus on evolution in polymer print materials and subsequent market opportunities associated with them. Print materials made of plastics and polymers are defined by the parameters of their parent 3D printing processes. By analyzing five major polymer 3D printing processes in depth, SmarTech's latest polymer print materials market study provides the most accurate and detailed resource on opportunities for plastics in 3D printing ever available. Utilizing purpose-built proprietary 3D printing market models, the author is able to present detailed market forecast data on thermoplastic filaments, powders, photopolymers, composites, and more utilized in popular print technologies like Fused Deposition Modeling, Stereolithography, Selective Laser Sintering, binder jetting, PolyJet, and many more. All available materials for the five primary polymer print technologies are analyzed and forecasted, including market revenues as well as material shipments, by industry and geography, over the next decade. Therefore, the author believes that Polymer Materials: 3D Printing Opportunities - 2015 will provide exceptional value to business development professionals and internal market strategy teams for the global chemical and polymer industries, as well as polymer 3D printer manufacturers, print service providers, and developers of polymer 3D printing manufacturing solutions.